Smurf reward charts! 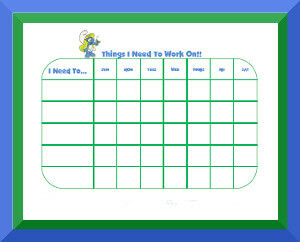 Motivate your child with our cute Smurf's behavior charts! Enjoy your favorite Smurfs character! These charts are great for young kids and toddlers. You might also like our Behavior Charts with TV/Movie Characters, Disney Jr. Behavior Charts or Nick Jr. Behavior Charts! You can use the "comments" space to list rewards earned or comment on how the week went.